In this free video course, I walk you through the process of starting your own website. In the first (six-minute!) video of the series, I show you how to purchase hosting, get a free domain name, and install WordPress. In the rest of the video course, I teach you to become a WordPress master. Check out the full free online course now! WorkBurst is a productivity app for OS X. It’s a menu bar application that breaks your work into 15-minute chunks, each with a five-minute break in between. Every four cycles, you get a longer 10-minute break. The best part about WorkBurst is the screen dimming. When it’s time for a break, your screen will automatically adjust to 20 percent brightness. This encourages you to get up and look away from the screen, greatly reducing eye strain. It costs $0.99 and is available now in the Apple App Store. Want to see how I made it? I want to make getting an app in the App Store as straightforward as possible. My online course will give you everything you need to go from zero experience to submitting an app to the App Store. If you have no idea where to start, my online course will get you to the next level and keep going until you have a finished product in your hands. Good mobile apps are built with a solid foundation. If this is your first time designing an application, you may not have all the knowledge to really optimize your time and make the most out of your money. When I began working on my first app, Reader Tracker, I couldn’t even ask questions because I didn’t know what questions to ask. I wrote this book to help others who are in the same situation as me. This isn’t just a compilation of old blog entries that I’ve compiled together into an ebook. You’re getting entirely original content that you won’t find anywhere else on the web. Best of all, I want to give it to you free. 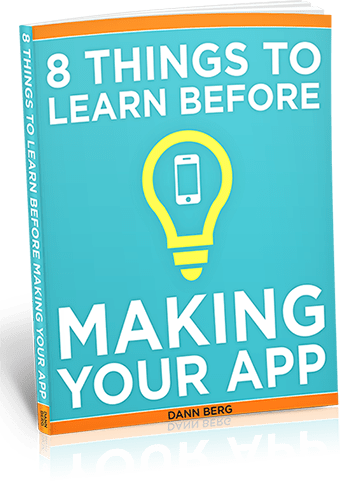 Get 8 Things to Learn Before Making Your App.